The performing arts department offers educational and performance opportunities in music, theatre, and dance to all students regardless of prior experience. Students are encouraged to explore the performing arts in an effort to understand how they reflect multiple cultures and trends, both past and current, as well as how they can affect and enhance their own life experiences. 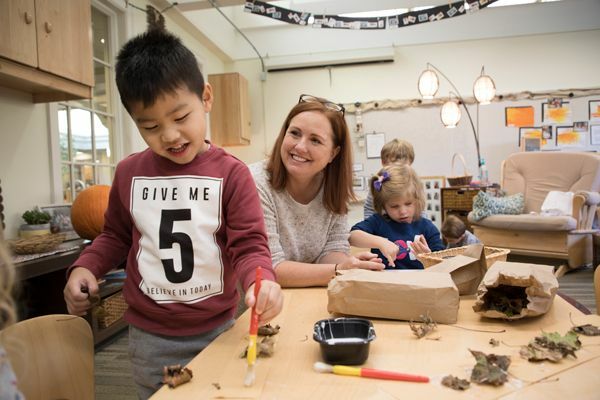 The Early Childhood music program at Hawken School is based on the belief that every child has the innate potential to learn music. Children begin their musical journey at Hawken School by absorbing, responding, babbling, experimenting and imitating the musical sounds in their environment. Early childhood students attend a special music session once every 5-day cycle with an early childhood music educator. Classroom activities are designed to build or reinforce a love towards music and to provide a basis for the development of musical concepts and skills. In the Lower School, our music program helps to develop a positive attitude toward and understanding of music concepts and skills. In third grade music, students are introduced to the soprano recorder. In fourth and fifth grade, students select a string, woodwind, brass, or percussion instrument for musical study; each student participates in at least two public performances each year. Students in fourth and fifth grade can choose to participate in Lower School Choir, which presents an annual musical production. A designated performing arts wing features four classrooms designed for exploration, creation and performance. In the Middle School, Chorus, Strings and Band are offered as part of the curriculum. Students also have the opportunity to be part of the Jr. Hawken Players’ Society through participation in the Middle School musical, either on stage, behind-the-scenes, or in the pit orchestra. Upper School students enjoy a variety of music, dance and theater courses including Acting Fundamentals, Advanced Acting, Chorale, Concert Band, Creative Movement, Jazz Band, Stage Craft, and String Ensemble. Rockapella and Mariachi Band provide additional opportunities in musical performance. The Hawken Players’ Society is open to all students and produces at least one play and one musical each year. Independent study opportunities for students to write, direct, and perform their own compositions in any of the disciplines are strongly encouraged. Hawken Players' Society is Hawken's theater program. Students from the Upper School participate in all aspects of the productions. To learn more about the Hawken Players' Society, click here. A participant in the inaugural Playhouse Square Dazzle Awards, HPS won the award for “Best Technical Execution” in 2016 for its production of Into the Woods. In 2017, the cast and crew of Hawken Players’ Society production of Les Miserables brought home two Dazzle Awards: Best Musical and Best Supporting Actress (Cassandra Knaggs ‘17).